Summertime is here, and the Elizabeth Mestnik Acting Studio is proud to announce our Summer Meisner Technique Intensive. Meisner Technique is a transformative acting technique, which takes the actor away from the introverting exercises many methods practice, such as emotional recall and sense memory. The Meisner Technique, on the other hand, seeks to do exactly the opposite. Meisner Technique believes in taking the intellect out of the acting process and having actors work entirely from their instinctive impulse. Sam Rockwell, Jon Voight, James Caan, Amy Schumer, Kathy Bates and Robert Duvall are just some of a long list of successful actors and actresses who have trained in the Meisner Technique. The Elizabeth Mestnik Acting Studio is currently interviewing for their 5-week Summer Meisner Technique Intensive. Classes begin on June 27th and run 3 times a week until August 1st. Daytime and Evening sessions are available. These classes will stimulate your imagination, reconnect you with your emotions and excite your spirit and passion for acting. At the Elizabeth Mestnik Acting Studio, we pride ourselves on turning good actors into great actors. That is why we have been ranked as Los Angeles top acting studio by CBS. We want people who are passionate, enjoy a challenge and really want to grow. 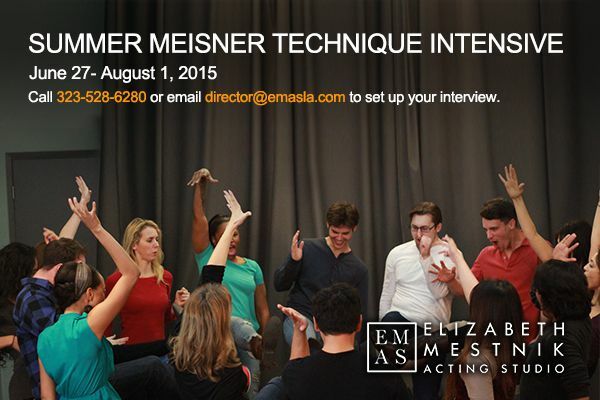 That is why admission to the Summer Meisner Technique Intensive entails a personal interview. If you believe in acting as a craft, if you want to exceed even your own expectations, this summer intensive is for you. Visit our website for more information on the Elizabeth Mestnik Acting Studio and the Meisner Technique. Call 323-528-6280 or email director@emasla.com today to set up your interview!